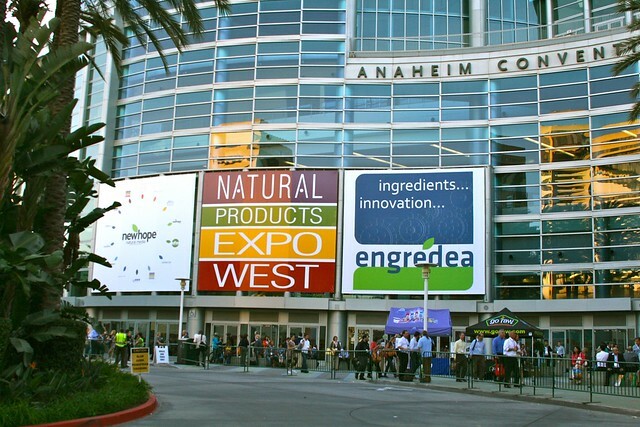 Welcome to ExpoWest 2012: My Favorite Things Part 3. As many of you know, I'm a big fan of whole grains. 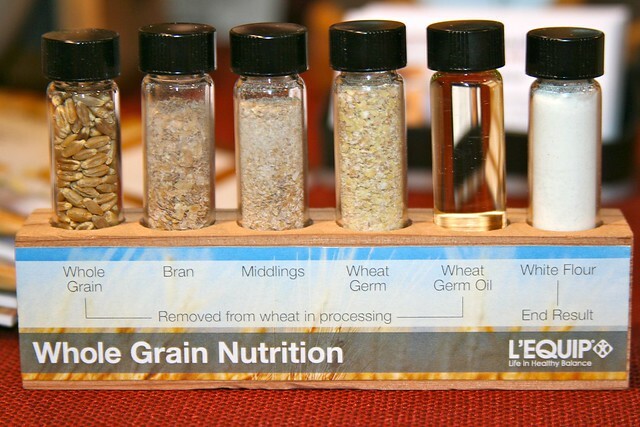 Whole grains contain the vitamins and minerals that are lost when we refine them to make white rice or refined flour. I love making my own sourdough bread, corn tortillas and tortilla chips, risotto (with brown rice), chocolate cookies, and other recipes with whole grains instead of refined grains. 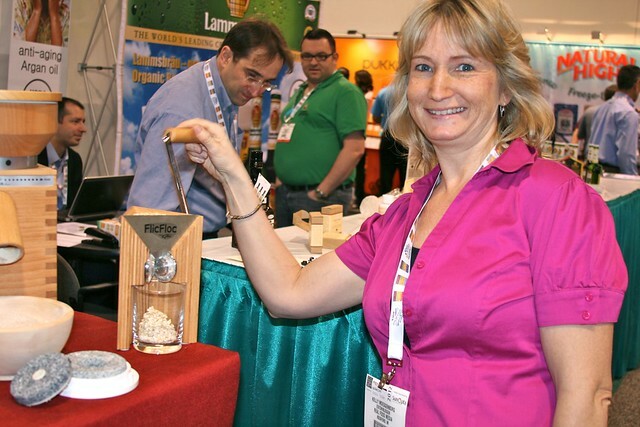 Check out some of the whole grain companies I met this year at ExpoWest. Bob's Red Mill is one of my favorite companies. Why? Because they believe in whole grains like I do. Not only that, but they are a company that cares about people. Thanks to the leadership of Bob Moore, the found of Bob's Red Mill. It was a hoot and the music was fabulous! 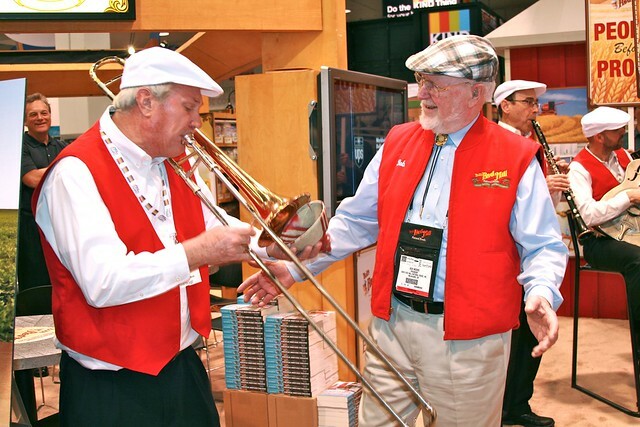 They were celebrating Bob's new book, People Before Profit: The Inspiring Story of the Founder of Bob's Red Mill. In an era of corporate greed, Bob Moore's philosophy of putting people before profit is a shining example of what's right about America. 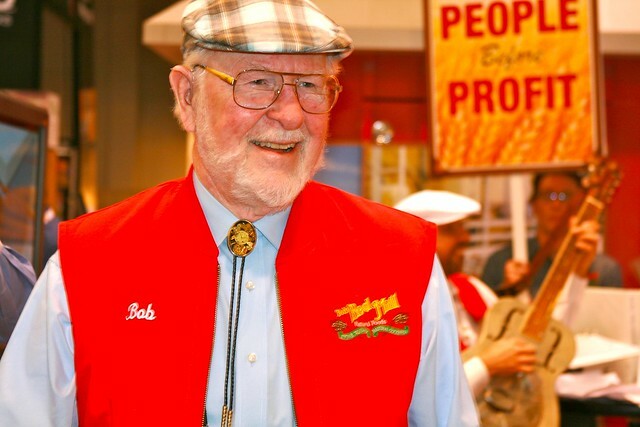 Instead of selling out to numerous bidders who would have made him a very wealthy man, the founder of Bob's Red Mill Natural Foods gave the $100 million company to his employees. Bob Moore's gift on February 15, 2010 (his eighty-first birthday), gave hope to an American workforce rocked by a decade of CEOs behaving badly. The national media heralded the announcement as the “feel good story of the recession.” It was an example of a return to ethics in the workplace, but as the legions of fans of Bob's whole grain natural products would argue, ethics and a sense of corporate responsibility didn't “return” to Bob's Red Mill, they never left. Most 60-year-old men who saw their business destroyed in an arson fire might have quit or faded away into retirement. Not Bob. After his wooden flour mill burned to the ground in 1988, he considered the seventeen employees who counted on him for their livelihood, and started over. He rebuilt, and flourished. 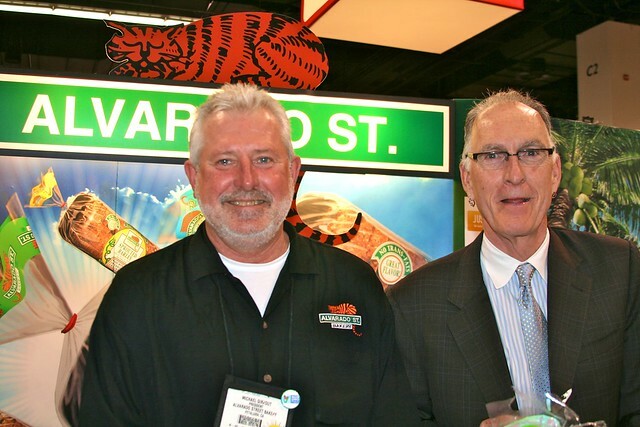 He grew the company to become the nation's leading manufacturer of whole grain natural foods. Bob's is an amazing story of overcoming challenges and making great comebacks. His wife, Charlee, was the inspiration to feed the family healthy natural foods, but it was a divine appointment with a random library book titled John Goffe's Mill that began Bob's love affair with the ancient art of milling, using stone wheels to slowly grind grains into nutritious whole wheat flours, cereals, and mixes. His unconventional thinking and passion for healthy living is an inspirational story for readers of all ages. Where to find Bob's Red Mill. 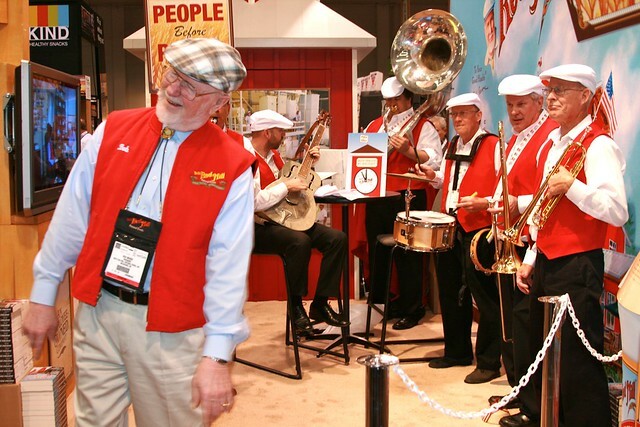 Bob's Red Mill products are available at Whole Foods and most supermarkets. You can also shop online. I've been buying Alvarado Street Bakery bread since the mid-eighties. Yes, I realize that dates me, as many of you were not born until the mid-eighties. In the mid-eighties, I was just out of high school, working as a nanny in San Francisco. We bought our Alvarado Street Bakery bread at the Marina Safeway. I've continued to buy their bread pretty much on a weekly basis ever since. Why? Because it tastes so good! It doesn't hurt that their products are sprouted AND whole grain. Yes, that means it's really, really good for you. Oh yeah and did I mention that they are a worker-owned cooperative (this means everyone makes money, not just the top level executives), a green business, and they are solar-powered? Yeah, they pretty much rule. Good things happen when hippies step away from the peace pipe and actually go and start businesses. I think these guys are so cool, so smart — an inspiration, really. 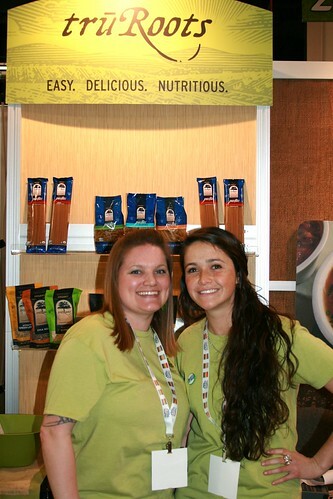 And I love kibbutzing with them every time I hit ExpoWest. They always make me laugh! Hopefully they will agree to be on my podcast once I get it going again. 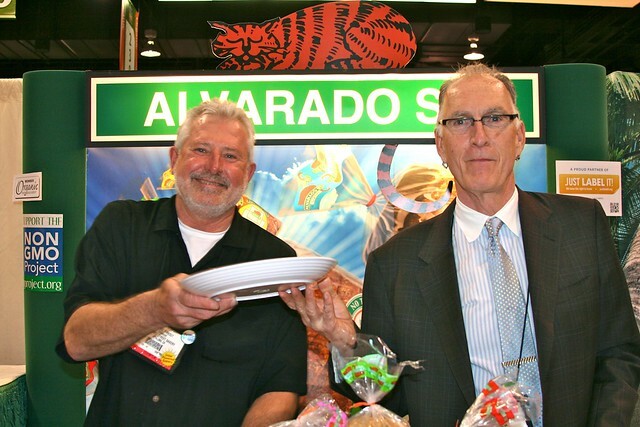 Where to Find Alvarado Street Bakery products. You can also find their products at Whole Foods and other natural food stores around the country. Pleasant Hill Grain is one of the biggest and best online sources of whole grains, grain mills, bakeware and cookware, and lots and lots of other stuff! Like me, they are a big advocate of eating whole grains. They sell pretty much everything you need to start cooking and baking with whole grains in your kitchen. From bulk whole grains to grain mills to bakeware to mixers to pizza stones. 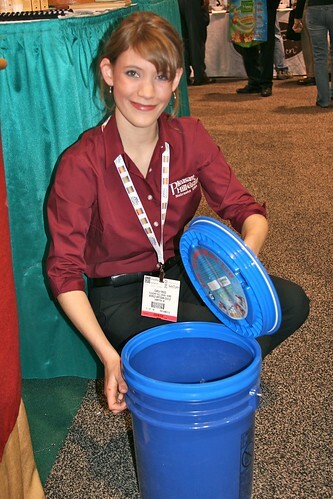 They also sell a ton of emergency preparedness items, from food-grade 5-gallon buckets with Gamma lids (also useful for storing whole grains for short term — this is how I save a lot of money!) to Berkey water filters to non-electric grain mills. 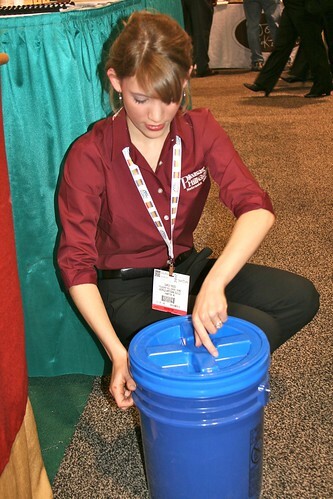 This is the food-grade bucket with the Gamma lid. It seals very tightly so you can buy your grains and beans in bulk and then firmly secure them and keep the pests and rodents out. And yes, you can color coordinate them! How fun is that? 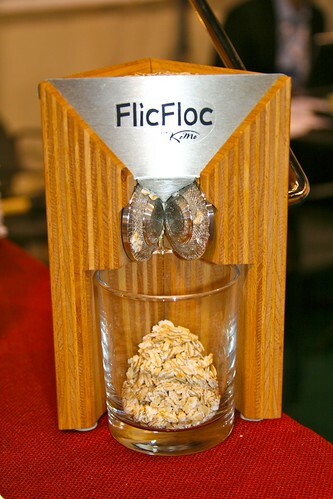 Here's Kelly the Kitchen Kop testing out one of my favorite gadgets, the Flic Floc oat roller. That's next on my list of items to get. It's the Rolls Royce of oat rollers. And so fun for kids! Shop online at Pleasant Hill Grain. To Your Health Organic Sprouted Flour Co. If you've been reading this blog for a while, you know I am a huge fan of To Your Health Sprouted Flour Co. They were one of our very first sponsors when I started the Real Food Media blog network back in 2008, and ever since they've felt like family to me. If you are looking for sprouted flour, I can't recommend them highly enough. I always keep sprouted flour in my freezer. I make my own sprouted flour, too, but I like to have back-up. You never know when you're going to want to whip up a batch of chocolate chip cookies! Next year at ExpoWest, they need to bring some of Peggy's sprouted flour pound cake and crackers. The booth was lovely and Jeff's fun, but you just can't beat Peggy's snacks. 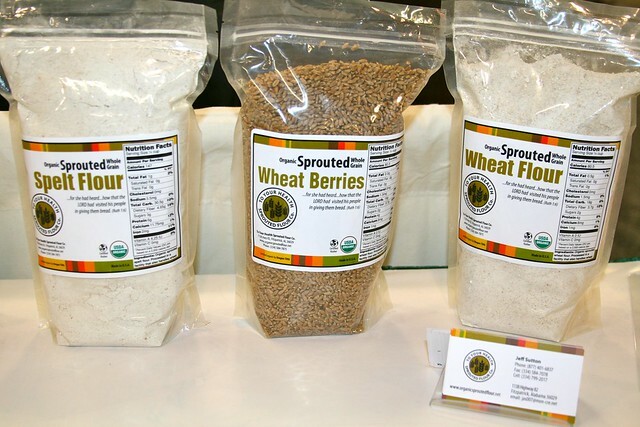 Where to Find To Your Health Organic Sprouted Flour Co.
Shop online at To Your Health Organic Sprouted Flour Co. I just found out about Tru Roots a few weeks ago from my friend and fellow Weston A. Price Foundation chapter leader, Tara Rayburn. She had them in her pantry and was raving about them. They sell organic sprouted quinoa, brown rice, and beans and seeds. Where to Find Tru Roots products in stores. Or shop for Tru Roots products online. Do you buy any of these products? What are some of your favorites? Please share your thoughts in the comments below. 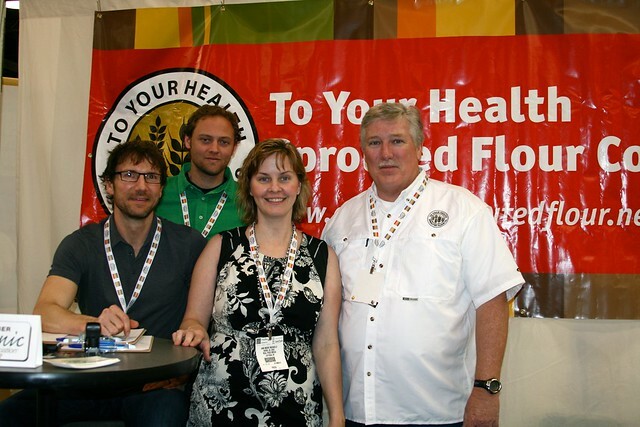 Tomorrow I'll be posting more of my favorite things from ExpoWest 2012 in part 4 of the series — check back! Looks like fun! I’m lucky enough to live close to Bob’s Redmill and get to visit it several times a year. After more than a dozen visits, I’m still in awe every time. And Bob is there, sipping on coffee, every time we go. Very nice man. My family really likes the Tru Roots products too! In fact, we’ve been able to find them at our local Costco. 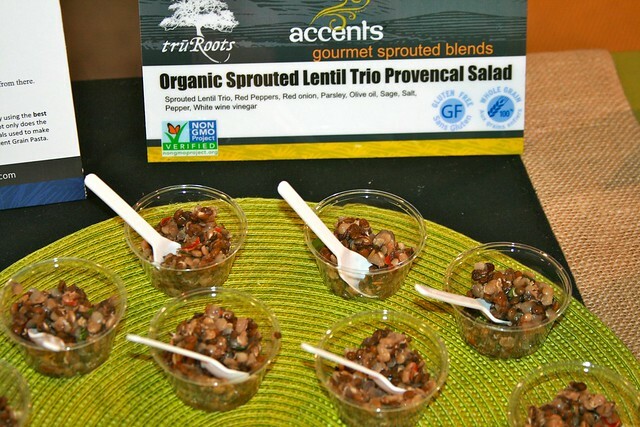 We especially like the sprouted bean trio. Yum! Bob is truly a good egg! That’s awesome that you found Tru Roots at Costco! We buy Tru Roots at Costco too, have used Bob’s Red Mill products for years and have just started using sprouted grains from To Your Health. Love their whole oats! We use the Margina roller. Made in Italy, I’m pretty sure it’s the same company that makes the Atlas pasta maker… which we also have. I am looking forward to making pasta from sprouted grain flours. Yum… linguine, my favorite shape! P.S. Thanks for sharing about Bob. Truly encouraging. It’s actually the Marga Molina… interesting that I remembered it as a contraction. Lol. I just made your coconut bread with Bob’s coconut flour! It was great!!! Does coconut bread count as a carb? Thanks for the tip on where to buy sprouted flour. I’m going to try and make some spelt tortillas! I think coconut flour is pretty low carb, but I’m not sure. 1/4 cup serving size: Coconut flour is 18g, buckwheat is 21 and sorghum is 25. Those are the only flours I have in a package for easy comparison. Maybe it’s not full of carbs, but I am craving it!!! I really need to buy Matt’s book. How many carbs does he say one should get? Yesterday, I ate what felt like a ton of carbs, and my temp was so low this morning. And I’m doing the Standard Process Thyroid. Very frustrating. Bob Moore has a Weston A. Price face! Seems very appropriate somehow. What an inspiring story, and it makes me happy that I support his brand. We also found Tru Roots at Costco! Bought a bag of the rice blend to try. I buy the truroots quinoa at Costco. Our Costco also started carrying another one of their products but I can’t recall what it is. That looks like it was SO fun! SInce my gut is better and better all the time, I am looking forward to eating bread by next year. I didn’t see it on your post and maybe you have commented on this CO. before “go Raw”? They have yummy sprouted snacks. They are not cheap but they are “good” in every sense, in a pinch when you need something on the go. Ann Marie this is probably not the best place to give you this link that I came across from Lydia at Divine Health but I would like your readers to see it. It would have been really helpful to me when I was starting GAPS a year ago. It explains why going low carb “too fast” can make you feel awful and start to question your new protocol. Every time I eat smoked Oysters from Trader Joe’s (They are my “fast food” snack) I think of all of the great and healthful/helpful things I have learned form you, thanks so much.